US, 1939, 85 minutes, Black-and-white. Basil Rathbone, Nigel Bruce, Ida Lupino, Alan Marshall, Terry Kilburn, George Zucco, Henry Stephenson, E. E. Clive, Mary Gordon. Directed by Alfred L Werker. In 1939 a version of The Hound of the Baskervilles as well as this Adventures of Sherlock Holmes were released and began the 14-film series of Sherlock Holmes stories with Basil Rathbone and Nigel Bruce as Holmes and Watson. This film had a bigger budget from 20th Century Fox and a more notable cast from the period. The rest of the series was made at Universal Studios, shorter in running time and with less starry casts. This film also introduces Professor Moriarty played by George Zucco, a sinister figure, freed from a murder charge, interfering in the lives of a wealthy family and hiring an assassin, but all the time intending to steal the Crown Jewels. Basil Rathbone made his mark as one of the best impersonations of Sherlock Holmes, with Nigel Bruce creating a naive and bumbling character as Dr Watson. Ida Lupino plays a threatened woman and Alan Marshall her fiance. There are complications with the threats to a family, a plan for revenge which is carried out. The fiance comes under suspicion, especially as Dr Watson sees him at a meeting with Moriarty. However, with the suspense of the murders and the chase, the attention is then given to Holmes confronting Moriarty at the Tower of London. This film was directed by Alfred L. Werker but most of the films and series at Universal were directed by Roy William Neill. 1. 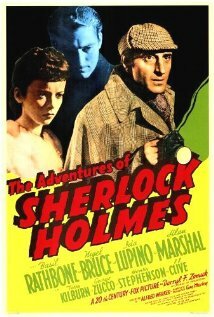 The first in the series of the Rathbone- Bruce Holmes and Watson films? 2. Production values, black-and-white photography, re-creation of the period, the cast, the score? 3. The title, the introduction, to Holmes, to Watson, to Moriarty? Audience knowledge of these characters and expectations? 4. The familiar aspects, the apartment in Baker Street, Sherlock Holmes and his lifestyle, the friendship with Watson, the care of Mrs Hudson, the boy cleaner of the rooms, visitors to Baker Street, Holmes and his methods, research, deduction, facts and logic, his capacity for disguise? Holmes as a strong character, his manner, speech? The contrast with Watson, bumbling, naive, but enthusiastic? 5. The status Moriarty, arch villain, acquitted for murder, his plans, the visit to Jerrold, implicating him in tilt? His hiring of the South American assassin? His plan to steal the Crown Jewels, diverting attention away from his plan? The attempts at execution? Confrontation with homes? 6. Ann, her family background, concern about her brother, the notes and the threats, the murder of her father, the theme of the Ancient Mariner? Jerrold, protecting her, the puzzle about his implications? 7. Watson, following Jerrold, seeing Moriarty come out of the meeting? Communicating his suspicions? dispute, revenge? Moriarty using him? 9. The real crime, the jewels, Holmes confronting Moriarty, the struggle? 10. Moriarty to live another day? 11. The happy ending to the romance?